How To Create Online Rental Agreement In Chhattisgarh? Chhattisgarh is one of the fastest growing economies in the country. Though agriculture is the primary occupation, it also has a well-established power sector, steel industry and aluminium sector making the secondary sector positively stronger. The abundant availability of natural and mineral resources and the increased exposure to the information technology sector provides an ample amount of job opportunities in the state. If you have moved to Chhattisgarh and are looking for a rental stay, then it is necessary to set up a rental agreement to ensure a peaceful stay in case a problem arises. To set up a lease agreement in Chhattisgarh, keep the following things in mind. The Chhattisgarh Rent Control Act, 2011, is the primary Governing law. Section 12; schedule 1, 2, 3 & 4 and Section 13 give further insight to the formation of the rental agreement in Chhattisgarh. This is an Act to provide for adjudication of matters relating to rent by a Tribunal and it promotes accommodation by balancing the interest of landlords and tenants. A Rental Agreement or Lease agreement is a contract between a landlord and a tenant whereby a landlord gives the tenant the right to occupy a rental premises. 11-month Tenancy Agreement – An agreement set up for 11 months after which it expires. The agreement could be renewed if desired by both the landlord and the tenant with or without a change in the existing conditions. Long Term Lease Agreement – This type of agreement is commonly used for residential purposes.This is set up when the tenant wants to rent the property for a longer duration of time, say 1-5 years, 5-10 years, 10-15 years and so on. Commercial Lease Agreement – It is a formal agreement to rent a property exclusively for business purposes. This agreement can be personalised by adding specific clauses as per the business requirement. Draft an agreement taking into consideration the interest of both, the landlord and the tenant. Print it on a stamp paper with the recommended value. The document must be signed by the landlord, the tenant, and two witnesses. Register the document in Sub-registrar office. Lock-in period: This is the minimum period before which both the parties cannot terminate their agreement. A Penalty for late payment: The landlord is allowed to impose a penalty in case the rent is not paid on time. Pets: The landlord can mention if he entertains pets in the property. Security Deposit: The agreement should specify the amount paid as the security deposit. This amount is to be paid back to the tenant at the termination of the suggested time deducting any cost required to meet the damages. Payment for maintenance works: The payments for all the maintenance work is to be paid by the landlord if it was not caused due to the irresponsibility of the occupant. Any other clause could be included in the agreement as per the requirement of both the landlord and the tenant to formulate ground rules and to avoid any further miscommunication. Stamp duty is the tax that is levied on the document with a view to make it legally valid. This is done by paying the mentioned amount by purchasing the stamp paper and printing the rental agreement on it. E-Stamping was introduced in 2015 in the state of Chhattisgarh for better convenience of the citizens and also to prevent the circulation of duplicate and fake stamp. Stamps of different values from 5 to 50,000 are issued. This scheme would ensure the availability of stamps of any rate at any time as demanded by the people. In India, it is not necessary for the rental agreement to be notarized. However, if the landlord or the tenant wishes to do so, they could simply follow the following steps. Draft a document with the detailed specification of both the landlord and the tenant. Get the document printed on a stamp paper of the recommended value. Get the agreement signed by the landlord, the tenant, and two witnesses. Go to a Notary Public and mention the need. Get the agreement attested by the Notary Public. Why Register Your Lease Agreement? Even though an 11-months rental agreement does not demand the requirement of registering the document, long time lease agreement and commercial lease agreement mandate you to register the same. Also, in the case of a dispute, it is always better to have an already existing contract which mentions the do’s and don’ts and helps in forming basic foundation rules. How To Make A Rental Agreement Online? Finding a good lawyer and making a lease agreement could be a tedious process. To create a rental agreement online, follow the steps below. Visit LegalDesk.com and view our ready to customise rental agreement. Fill up the details of both the landlord and the tenant and the property meant to be leased. To personalise the contract, add additional clauses as per your requirement. Go through the deal and print a copy by yourself or let us print it for you on a stamp paper of recommended value and deliver it to your address. Go to nearest Sub-registrar office and get the agreement registered. 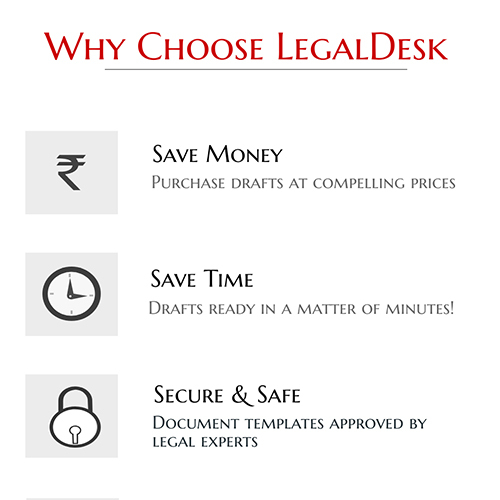 Creating any legal document is now much simpler with the help of our readymade drafts and customised services. If you wish to draft your rental agreement, we also provide the provision of printing your contract on a stamp paper and delivering it to you. Apart from online rental agreements, we also provide various other services. To know more, do have a look at our array of legal documents. To proceed to draft your on rent agreement, click the button below and fill up the blanks! There are 0 comments on "Rental Agreement In Chhattisgarh".